No, this isn’t part of a line of toys cross-promoting a ridiculous new storyline in the Batman comics. Though barnyard animals would provide a welcome reprieve from DC Comics’ nearly-indecipherable storytelling of late. Not a good sign when I have to visit Wikipedia to explain the comic book I just read. My occasional spasms of mental incompetence can only account for part of the blame. Courtesy of Action Figure Insider comes this Batman action figure and sow-ish accessory inspired by an episode of the not-at-all-confusing Justice League Unlimited, the fantastic cartoon series that aired a scant few years ago on Cartoon Network. And that’s no ordinary pig. That’s Wonder Woman, who has been transmogrified into Wonder Pig by Circe, the Greek goddess of casting bitchy magical spells or something. Kind of beats some little plastic bat-a-rangs, eh? 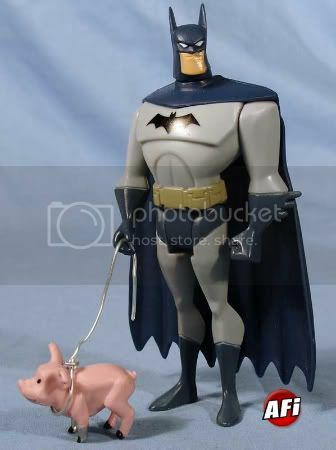 If you’re the sort that likes your action figures a little on the quirky and/or porky side, you can pick up Batman with Wonder Pig here on Amazon or on Ebay. Kinda makes me think of all those action figure battle pictures floating around the internet. That’s some cute pig!